Our COSY brand is trusted by thousands of customers and electronics goods dealers all over India and abroad for high quality products. We also undertake custom development projects . We continuously develop new products for different clients world wide to meet their customized requirements. 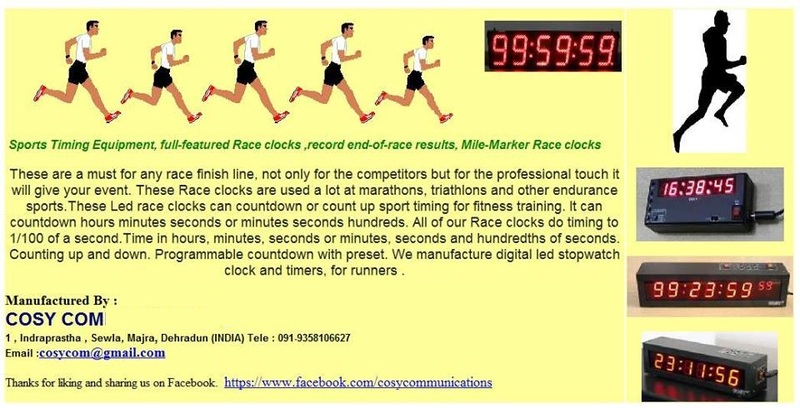 Some pictures of different types of displays and stopwatches are available below. Customers can select a suitable picture and inform us the details of exact requirements comprising of display size , indoor or outdoor use and how it is going to be used by them. International Buyers can easily send payments through Paypal . Pl. inform us your paypal email ID where we can send you invoice . They can also pay through TT bank Transfer by using our bank account information provided in above link. IMPORTANT : International shipments may sometimes subject to Customs Duty / Import Tax as applicable in different countries and same to be paid by buyers extra in their country . Pl. check with your local customs office for any clarification in this regard. Delivery : In case an order is placed on us normally we can ship one set of this stopwatch within one week from our works after receipt of payment. There might be change in delivery time due to any circumstances beyond our control and we shall not be responsible for any consequences. Courier shipping time will be extra as applicable for customer's location . All international parcels are shipped through EMS Speed post or FedEx Couriers. It normally takes any time between 7 to 12 days in shipping after dispatch from our works. Sometimes delays are possible due to customs clearance process in either country. PCB Manufacturing and Assembly: Bittele Electronics is a low-cost, turnkey, PCB assembly service provider for prototype and low-volume, electronic contract manufacturing.